Amazon or eBay? Which is better for selling? blog Amazon or eBay? Which is better for selling? When looking to sell your products online, what is the best option? Ebay and Amazon are by far the biggest platforms and both are good options as they get high levels of engaged traffic. 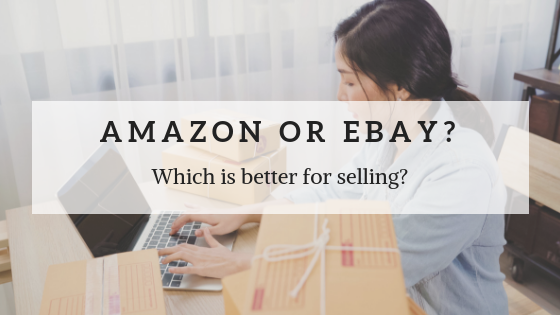 But which one of these should you sell with: Ebay, Amazon or both? Each platform has its advantages and you should pick the one that suits your business best. We have made some points for and against each platform, weigh up both sides of the argument and choose what is best for your business. Based on recent statistics, its reported that Amazon gets roughly double the users per month that Ebay gets. Meaning there’s more exposure for your brand and products on Amazon over Ebay. When buying on Amazon over Ebay, people expect to pay a little more as Amazon has a reputation for selling items of higher value. But prices still need to be good value for money, and very competitive as there are a lot of sellers. Getting your products on ‘Prime’ will be a huge selling point for your items and set you apart from other merchants. If a customer can get the item delivered next day with Prime they will be willing to spend a little more for the convinience. Through Amazon you can get great additional benefits you can’t get on Ebay. For an extra cost, Amazon will take care of shipping your orders, storing your products, distributing and packaging. Taking all of this out of your hands could be a huge help for people running their own business and save so much valuable time. Plus the reliability that this service offers, with fast and trusted shipping, will reassure customers of your legitimacy. 40% of all sales on Amazon are on Amazon’s own products. Sellers often describe competing against not only other sellers on the platform but against Amazon too. Many complain that they cannot rival the Amazon own product as they can’t afford to drop their prices to the same level. Ebay is a valuable place to grow your brand. Amazon is saturated with big brands, and it can be difficult for small up-and-coming companies to grow. With less large companies on Ebay it can give your brand more opportunity to stand out. As mentioned above, Amazon offers additional benefits such as shipping. Using Ebay you are in charge of these things for yourself. This allows you more control over these aspects, but also means more work. If you are happy to do the shipping and packaging yourself to save money, then ebay is more affordable. Ebay offers the auction model for selling, a feature that Amazon and most other platforms do not have. If this is something you think will be useful for your type of products then Ebay is a great choice. People do expect Ebay to be cheaper than Amazon, so if you are selling on this platform your prices need to be competitive.Ebay has a reputation for marked-down or second-hand items. This is a point to consider whether you want your brand to be associated with this reputation. It is cheaper to sell your items on Ebay than on Amazon. The seller fees percentage is a fair amount less on Ebay, meaning you keep more of your profits. SSL Certificates: What Are They And Why Are They Important? What Contributes To Your Google Ranking And How To Do Better? Eventure are helping companies reach their full potential by thinking digitally. For a free review of where you are, and a no obligation quote for where you could be call us on 0845 166 2703 or drop us a mail and we'll be in touch.